BORN A. D. 1175, of a noble Spanish family, Raymund, at the age of twenty, taught philosophy at Barcelona with marvellous success. Ten years later his rare abilities won for him the degree of Doctor in the University of Bologna, and many high dignities. A tender devotion to our blessed Lady, which had grown up with him from childhood, determined him in middle life to renounce all his honors and to enter her Order of St. Dominic. There, again, a vision of the Mother of Mercy instructed him to coöperate with his penitent St. Peter Nolasco, and with James, King of Aragon, in founding the Order of Our Lady of Ransom for the Redemption of Captives. He began this great work by preaching a crusade against the Moors, and rousing to penance the Christians, enslaved in both soul and body by the infidel. King James of Aragon, a man of great qualities, but held in bond by a ruling passion, was bidden by the Saint to put away the cause of his sin. On his delay, Raymund asked for leave to depart from Majorca, since he could not live with sin. The king refused, and forbade, under pain of death, his conveyance by others. Full of faith, Raymund spread his cloak upon the waters, and, tying one end to his staff as a sail, made the sign of the cross and fearlessly stepped upon it. In six hours he was borne to Barcelona, where, gathering up his cloak dry, he stole into his monastery. The king, overcome by this miracle, became a sincere penitent and the disciple of the Saint till his death. In 1230, Gregory IX. 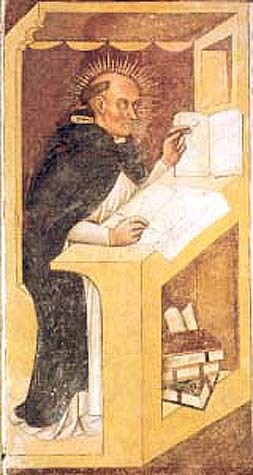 summoned Raymund to Rome, made him his confessor and grand penitentiary, and directed him to compile “The Decretals,” a collection of the scattered decisions of the Popes and Councils. Having refused the archbishopric of Tarragona, Raymund found himself in 1238 chosen third General of his Order; which post he again succeeded in resigning, on the score of his advanced age. His first act when set free was to resume his labors among the infidels, and in 1256 Raymund, then eighty-one, was able to report that ten thousand Saracens had received Baptism. He died A. D. 1275. Reflection.—Ask St. Raymund to protect you from that fearful servitude, worse than any bodily slavery, which even one sinful habit tends to form.